A bidding war appears to be shaping up for the Orange County Register, where the winner could emerge as the dominant player in a series of consolidations that eventually puts the major dailies in Southern California in the hands of a single owner. The leading bidders in what is likely to be a small but vigorous duel for the Register are MediaNews Group, which operates the neighboring Los Angeles Newspaper Group (LANG), and the Tribune Co., the owner of the nearby Los Angeles Times. Each of the neighboring publishers is widely known to covet the crown jewel of Freedom Communications, a sprawling media company put on the block by the distressed-debt investors who gained control of it in 2010 as it emerged from bankruptcy. To be clear: The situation is fluid and either or both of the publishers might balk at buying the Register. It’s also conceivable than an unexpected third party will turn up as a spoiler or that Freedom will reject every bid as unacceptably low. But the contest for the Orange County paper is likely to be keen because “neither of those guys wants to be the one who didn’t get the Register,” said one knowledgeable source. MediaNews and Tribune both will stretch for this deal, said industry sources, because each company knows that the strategically located Register is the key to stepping up the scale – and, therefore, the profitability – of its existing operations in Southern California. Enhanced scale boosts profits because it sharply raises revenues while reducing costs for administration, ad sales, production, content-gathering, marketing, circulation and almost everything else. Lower costs and higher profits are always desirable in business, but they are particularly crucial for the newspaper industry, where advertising sales have plummeted by nearly half since 2005 – and continued sliding in the first months of this year. Bigger sales and sturdier profits would be extra-desirable for both publishers as they each seek to recover from bankruptcy. MediaNews emerged from Chapter 11 last year and Tribune is struggling to conclude a long-running reorganization snarled by feuding groups of creditors. Even though Tribune is operating under the supervision of a federal bankruptcy court, most observers believe an acquisition could gain approval from the judge, as it would strengthen the viability of the business when it is discharged from bankruptcy. 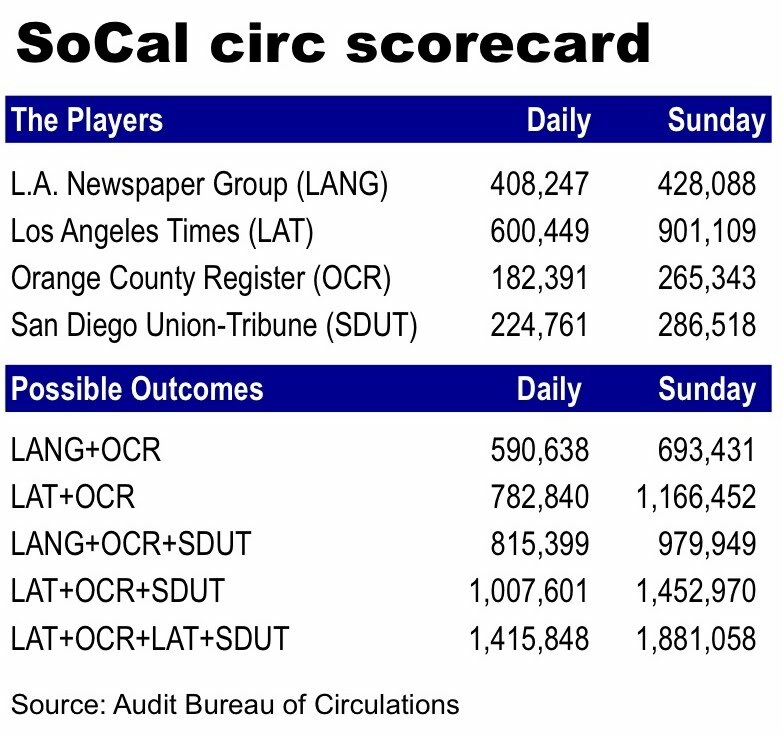 :: MediaNews – As illustrated in the table below, the combination of the 182,391-daily circulation of the Register with the 408,247-weekday readership of the nine LANG dailies would rival the 600,449 daily circ of the Los Angeles Times. On Sunday, the LAT would have the edge with 901,109 vs. 693,431 for the LANG-Register combo. :: Tribune – If the Los Angeles Times acquired the Register, the combined weekday and Sunday readership of the publications respectively would rise to 782,840 and 1,166,452. But the deal-making might not end with the sale of the Register. The victor (and, perhaps, the loser, too) likely would turn its attention to buying the San Diego Union Tribune, which was purchased at a fire-sale price in 2009 by Platinum Equity, a Los Angeles investment firm that is believed to have bumped the paper’s operating profits via aggressive cost-cutting to some $20 million from next to nothing. Industry sources believe the property could fetch some $100 million, producing tens of millions in profit for Platinum. 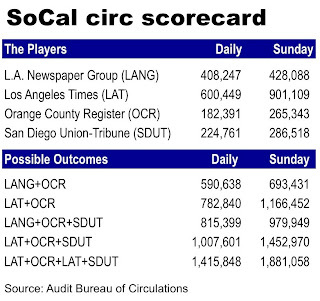 Add San Diego to the LANG/Register combo and you get combined circulation of 815,339/daily and 979,949/Sunday. Add San Diego to LAT/Register and you get total readership of 1,007,601/daily and 1,452,970/Sunday. Once three of the four SoCal publishers are consolidated into one operation, it is not hard to imagine the fourth being rolled into the fold. In that event, a single entity would publish all the dailies from the Tehachapi Mountains at the north end of metro L.A. to the Mexican border, producing 1.4 million weekday papers and nearly 1.9 copies on Sunday. The controlling interest in each of the four major newspaper companies in SoCal is held by financially oriented investors whose business model is to buy distressed assets at low prices, improve the profitability of the holdings by increasing sales and/or cutting expenses and then exiting deals as rapidly as possible through either an IPO or by selling the assets to someone else. One of the fastest and surest ways for the investors to hasten a profitable departure is by going for the operating synergies bound to result from putting their assets together. Since some of the investors holding interests in the SoCal papers hold stakes in more than one of the subject companies, their financial interests and investment objectives appear to be well aligned. In that event, support for the biggest regional newspaper consolidation in history would seem relatively easy to muster. If Tribune or Lean Dean snag the Register and San Diego, what do you think Belo would do with Riverside and its six-figure circulation? I could certainly see if Tribune gets the Register -- and before going for San Diego -- that Lean Dean would set his sights on Riverside and try to form an Inland Empire powerhouse (with San Bernardino and Ontario already under his ax) -- an expansion Belo/Riverside should have done a decade ago when they could have owned the entire 3 million-plus population market. This consolidation would not include ALL the dailies between metro L.A. and the Mexican border...you omitted The North County Times, which serves N. San Diego and SW Riverside counties with a comprehensive local news report. Acquisitions got them into this mess, so I guess it's only natural to expect acquisitions to get them out of it. If only. Wouldn't the Justice Department's anti-trust division oppose these consolidations? If the deal includes the rest of Freedom and not just the OCR, MediaNews would also benefit greatly from acquiring Freedom's second-biggest property, the Colorado Springs Gazette. That would add to MNG's portfolio of Colorado Front Range newspapers with the Denver Post (corporate HQ) east to a bunch of small town newspapers on the state's eastern plains, north to the Boulder Daily Camera and recently-purchased Longmont Times-Call (and two other smaller properties). The only major papers left in the geographic region would be the Pueblo Chieftan (two hours south from Denver), the Greeley Tribune and the Fort Collins Coloradoan. The Gazette would be a plum in MediaNews's home state empire. BTW to the one commenter, "Lean Dean" Singleton isn't calling the shots anymore -- as Alan points out, MNG is now run by bankers and finaciers. Alan -- you make an all-to-common mistake when you use the terms "circulation" and "readership" interchangeably when they are two different things. Circulation is the number of newspapers sold. Readership is the number of people who read the newspaper. Your analysis is based on circulation alone.